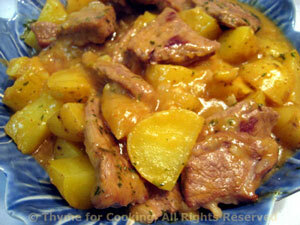 Thyme for Cooking Menus: Braised Lamb with Potatoes and Onions, easy recipes. Our main course is Spanish this week - and it's an easy dinner that can expand for a small party. Casseroles and slow-cooked dishes are very popular in Spain. Usually made using pork or lamb, with potatoes and onions slowly simmered with the meat, they are served from the cazuela or baking dish. In plastic food bag mix flour and paprika. Cut lamb into 1 1/2" (4cm) pieces and trim excess fat. Add lamb to flour and mix to coat well. Heat oil in a heavy pot or Dutch oven with tight-fitting lid. Add lamb (reserve any remaining flour) and brown on all sides. Remove lamb and sauté the onion and garlic until tender and starting to brown, about 7 minutes. Sprinkle with any remaining flour/paprika and stir well. Return the lamb to the pot, add herbs and stock. Cover, turn heat to low and braise for 30 minutes. Cut potatoes into 1" (2.5cm) chunks. 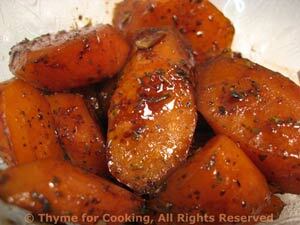 Add to the pot, stir well and continue to simmer 30 minutes longer, until potatoes are done. If it starts to dry out add a bit more chicken stock or water. When potatoes are done, remove bay leaves and serve.